Robert James Borck was born on September 1, 1943 to parents Robert and Pansy Borck. He passed away on December 2, 2018. Robert was a military man; he served in the US Army for many years. He later became a police officer. After his career as an officer, he went to college and became an engineer machinist. Robert was the oldest of 17 siblings; 11 brothers and 6 sisters. He is the first to pass on. Robert had an amazing sense of humor to beat no other, always had a smile on his face and a joke for every occasion. He has traveled many places and made lifelong friends. He was a kind and generous man. He always told it like it was. He would say ‘never trust a man that won’t shake your hand’. Robert struggled with health issues for years, many times told he wouldn’t make it, but true to form, he always did thing his way on his own terms and time. Robert was an amazing man, talented, smart, and full of love for his family and friends. And he will forever be loved and missed. Robert was preceded in death by his son, Gary Dean Gilbertson, and his parents, Robert and Pansy Borck. He leaves behind the love of his life, Shirley Dollarhide. Robert is survived by daughters; Tammy M. Case, Rebecca J. Rojas, April M. Larrabee, Shelley Barthalomew, Brenda Kearl, and sons; Robert West, and William Dollarhide, as well as many sons and daughters-in-law. He is also survived by his many grandchildren, including; Kimberly, Gary, Davie, Alicia, Bryan, Dillion, Julie, Justin, Alyssa, Nicole, Amber, Ryan, Breezi, Andrew, Pamisue, and Paytin. He also leaves behind many great grandchildren including; Zach, Miley, Orion Robert James (RJ), Christina, Alexis, Michael, Ethan, Emily, and several more. Flower donations may be send or taken to Macy & Son Funeral Home, McMinnville, OR. 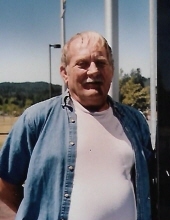 A memorial service will be held on Saturday, December 15th, 11:00am, at the Willamina VFW Hall. To send flowers or a remembrance gift to the family of Robert James Borck, please visit our Tribute Store. "Email Address" would like to share the life celebration of Robert James Borck. Click on the "link" to go to share a favorite memory or leave a condolence message for the family.